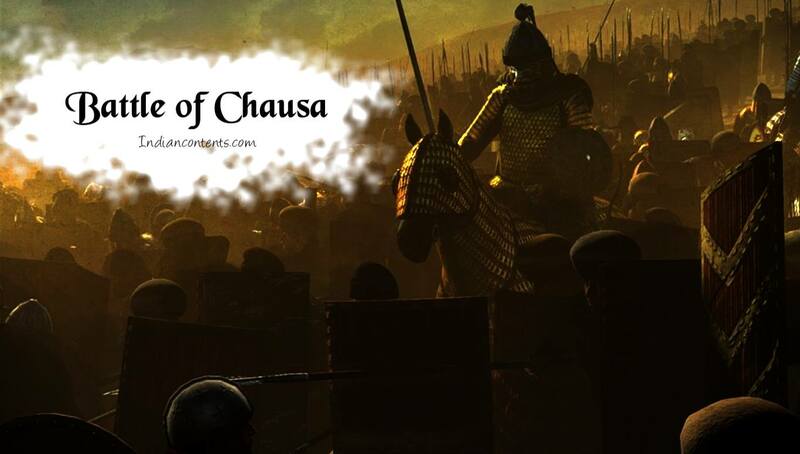 The Battle of Chausa was fought between Mughal Emperor Humayun and Sher Shah Suri (Sher Khan) of Su Empire. The battle took place on June 26,1539. Humayun decided to conquer Bengal (Gaur) after capturing Chunar. Later Humayun marched to Gaur (Bengal) and defeated Jalal Khan (Son of Sher Khan). While Humayun was busy in Bengal Sher Khan strengthened his forces against Humayun. After capturing Bengal Humayun retured towards Agra. Afghan forces of Sher Khan had already occupied Munger and had imprisoned its Mughal governor, Khan-i-Khanan Dilawar Khan and had also blocked the narrow defiles of Teliagarhi which were situated on the southern bank of the Ganga. At Munger Humayun crossed the Ganga to its southern bank and took the old Grand Trunk Road which passed through south Bihar which was under complete control of Sher Khan and reached Chausa. (at the boundary between Bihar and Uttar Pradesh on the confluence of River Karmanasa and Ganges.) Later Sher Khan also reached there with his troops. The two forces camped opposite each other for three months, but none of them took up the attack. Sher Shah purposely delayed the battle and waited for the rains which could create problem for the Mughal army camped on the banks of Ganga. In these three months Humayun (Mughal) forces suffered the scarcity of food. Humayun realized the weakness of his situation. He opened the negotiations and made attempts to conclude peace (treaty) with Sher Khan. As per this treaty, Humayun agreed to allow Sher Shah Suri to rule over Bengal and Bihar. In return, he would give recognition to emperor. But Sher Shah negotiated to the treaty. The rains were started and the Mughal camp was flooded. Taking advantage of the situation, Sher Khan made a surprise attack on the Mughals from three directions. He was aided by his son Jalal Khan, and his greatest general Khawas Khan, just before dawn on June 26, 1539 CE. The Mughal forces were completely routed and put to flight. Finally the Mughal army was defeated. Humayun just saved his life by throwing himself into the river Ganges and reached Agra. Sher Khan defeated the Mughal emperor Humayun and declared himself the Sultan and assumed the title of Farid al-Din Sher Shah. Sher Khan then marched to Bengal and brought Bihar and Bengal under his control by deposing the Mughal governor Jahangir Beg and then returned to Kannauj. Later Sher Khan again defeated Humayun at the Battle of Bilgram on May 17, 1540 CE.